"China has the best human rights record in the world," says one. "The Chinese state enjoys greater legitimacy than any Western state," claims another. These contentious comments aren't those of domestic scholars defending the motherland, but foreign observers who increasingly seem, as some put it, "more Chinese than the Chinese." As overseas academics and former government officials come to China in great numbers, their warm embrace of the country have earned them the ironic nickname of "foreign 50-cent Party," suggesting they are paid to cheer for the authorities. Most of them reached by the Global Times admitted they were not actually China specialists but added they did not get paid by the Chinese government. 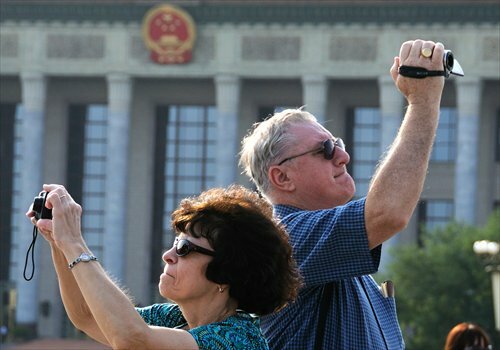 Even as domestic opinion polls reveal a growing intolerance of social problems - from a population well familiar with Western criticisms of China - these positive comments provide Chinese people with a different perspective to look at their own country, says Wang Yiwei, a professor at the School of International Relations at Beijing's Renmin University of China. "It looks like they are defending China for us, so it is unfair to respond with a negative label," Wang told the Global Times. "They don't come here to 'sing' for the Chinese government. They come to solve the puzzle of China's success, and then bring the answer back to their own countries." John Ross, a former director of London's Economic and Business Policy to ex-London Mayor Ken Livingstone and current Senior Fellow with the Chongyang Institute, also at the Renmin University, is one of a number of foreign academics on the receiving end of attacks by some netizens for his open criticism of liberal "public intellectuals" that, Ross says, do not really "understand" democracy. On June 12, Ross published an op-ed in China saying that the US is clearly wrong over China's human rights record. "The attempt to reduce human rights to a Western-style political structure, as though having a parliamentary system were the most important question facing human beings, is ridiculous," Ross wrote. He argues that the idea that China has "raised" 630 million people out of poverty - more than the population of the United States - is more important than having access to Facebook. Ross says his chosen headline was "China has the best human rights record in the world." The op-ed has been published three times in China so far, both in English and Chinese; none have used his original title. "When I say 'China has the best human rights record in the world', it's not meant to make China feel good… it was an objective statement," Ross told the Global Times. "If somebody doesn't agree with that, let's have a discussion on who has a better human rights record, and why. And you will find out during the discussion that [the idea that any country has a better human rights record than China] is not true," he concluded. "Record clearly indicates development over time, no other country remotely approaches China's achievement in bringing over 600 million people out of poverty, with all the increases that has brought to the well-being of humanity" said Ross, "Of course, some countries in Scandinavia, which have very high living standards and social protection, and no record of aggression against other countries, have even higher levels of developed human rights than China, but they are too small to have contributed to the improvement in the conditions of humanity on the scale China has." Before working for think tank Chongyang, Ross was a visiting professor at Shanghai's Jiaotong University from 2009 to 2012 where he wrote a blog on globalization. His English blog "Key Trends in Globalisation" was recommended by Gavyn Davies, former Chief Economist of Goldman Sachs and former Chairman of the BBC as among less than 25 blogs internationally which he finds are necessary reading on the economy. Ross sees China as "the world's financial superpower." 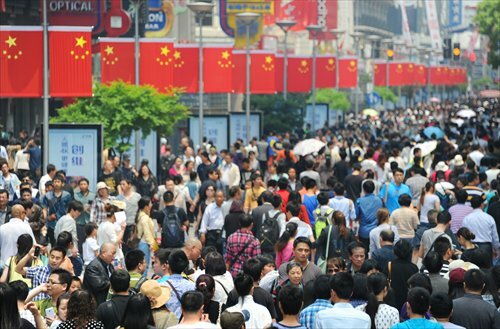 In a 2013 op-ed for China.org.cn titled "China has the world's fastest growth in living standards," he argued that what counts for true change in a population's living standards is how fast consumption overall is growing, rather than its percentage in GDP. Now he writes for Chinese media, including both state media and the leading private sector website Sina. Ross is a regular columnist on Sina's 'Opinion Leaders' site. One article, an analysis of the 12th Five Year Plan, won a Best Opinion gong at the 2011 National People's Congress (NPC) news awards. The feedback on his Weibo microblogging account - where he has 129,119 followers - is more nuanced (his updates are translated for him by a Chinese assistant). Ross says he uses software to read others' comments, including those which label him a "foreign 50-cent party" member. Ross says he supports the overall framework of China's economic policy since 1978, but "this certainly doesn't mean I agree with every single policy, and I publish articles criticizing some." There are many Chinese specialists who know more about the domestic economy," he admits. "But the area that I am particularly strong at, is the relation between the Chinese economy and the international economy." Ross is the first foreign senior fellow to work for Chongyang, according to Wang Wen, Executive Dean of the Chongyang Institute for Financial Studies at Renmin University. In 2013, a total of 15 foreign academics and former officials were hired as senior fellows to the university's think tank, including Argentina's Carlos Magariños, the former Director General of United Nations Industrial Development Organization. "China's increasing soft power has also attracted international dignitaries," Wang told the Global Times, adding he is expecting more like Ross to join Chinese think tanks. Wang finds the "50 cent" label upsetting: "I feel sorry for our own people because they can't find a better way to argue with [Ross etc] through facts or statistics, so they have to label them." Wang says that working for Chongyang does not limit academics' freedom of speech. "They are encouraged to give constructive advice," he says. If Ross is now best known for praising China, then academic Clifford Kiracofe made his name for criticizing the West. As a former "Senior Professional Staff Member" at the Senate Foreign Relations Committee, Kiracofe spends half his year teaching at the China Foreign Affairs University and the other at the Virginia Military Institute. "I am a critic of America's foreign policy. My views are considered 'politically incorrect' in the US," history and international relations expert Kiracofe told the Global Times. According to Kiracofe, he enjoys more freedom of speech in China than in the US. "Most American journalists do not want to criticize America's foreign policy very strongly," he argues. "My articles are too critical, so they won't easily get published in the US news media." Although the ability to get published does not equal a human right - many Americans have blogs with which to freely practice their First Amendment rights, for example, Chinese media does provide Kiracofe with a platform. His views about US foreign policy are frequently seen in English-language news media, including this newspaper, and his voice can be heard commenting on China Radio International's news programs. Speaking to the Global Times, Kiracofe says, "I try to present a different perspective of the United States to show Chinese people not all American professors are supportive of American foreign policy." Hugo de Burgh, Professor of the Journalism and Director of the China Media Centre at the University of Westminster, is another who says he is trying to show Chinese audiences a different version of the West. His documentary What You Didn't Know About The West, which aired on CCTV last year, featured de Burgh unpicking "myths" about Western culture such as freedom of the press, food safety records and economic prosperity. It aims to provide lessons for China to learn from these apparent mistakes. However, greeted the show as satirical, dubbing de Burgh with the ironic sobriquet "Senior Black." Wang explains, instead, that these foreign observers have noticed the difference in the way Westerners see China and the way Chinese do. "These foreign academics found China different than what is presented in Western media," Wang says. "They try to see it from the inside, to find out what made [China] so successful." Martin Jacques, author of the controversial titled When China Rules the World: The Rise of the Middle Kingdom and the End of the Western World, says his purpose in writing such a book was to help the West adjust when it is not longer dominant. After publication in 2010, the book prompted much discussion, but Jacques says he also noticed a change in attitudes toward China. "People are more willing to think differently, to listen to different arguments," Jacques told the Global Times in a phone interview. He also noticed two different reactions from Chinese readers: some said the book's arguments felt good coming from a foreigner. Others responded that China has no intention to rule the world, saying the country intends to rise peacefully, cautiously and humbly. "I am really moved when Chinese people told me 'You really understand China,'" Jacques says, adding that he spoke mainly to Chinese scholars rather than any government officials, and the book was meant primarily for Western audiences. Nevertheless, what surprised him was the reaction from some in China who called When China Rules the World "one of the best books written about China in the past 20 years." Now Jacques visits at least four times a year, giving talks and speeches at universities, institutions and companies. Kiracofe encourages more Westerners to come to China to see the country for themselves. "When you are in the US, you are bombarded by the news networks that create a hostile and negative impression," he thinks. "Anyone who has physically come here, looked around and interacted with the people, they will find China different."